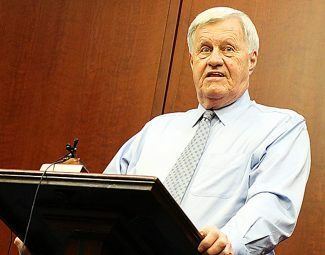 House Agriculture Committee Chairman Collin Peterson, D-Minn., speaks to the North American Agricultural Journalists this morning on Capitol Hill. House Agriculture Committee Chairman Collin Peterson, D-Minn., said today he wants subcommittees to play a major role in this Congress and, to emphasize the point, arranged for two House subcommittee chairwomen to meet with the North American Agricultural Journalists. Peterson told the journalists the committee "has new people, new diversity and new expressions of opinion. It used to be a committee of old white guys from the South and the Midwest. It's not any more." When farm groups ask to meet with him, he said, he tells them to meet with subcommittee chairs, and has decided that he will not attend those meetings because "if I go, it becomes all about me." When a cotton group recently asked him to speak in Texas, he sent Rep. Filemon Vela, D-Texas, the chairman of the General Farm Commodities and Risk Management Subcommittee, to the event. Vela already knew a lot about cotton but "did a lot of homework" to be even more expert and reported back that it had been a great weekend, Peterson said. "They're smart people, they can learn," Peterson added. Peterson also noted that the interest in the subcommittees has changed and that there is less interest in those that cover commodities and more interest in horticulture. Peterson said he is focused on the reauthorization of the Commodity Futures Trading Commission, which he does not expect to be controversial, and on convincing dairy farmers to sign up for the new dairy program. He said he expects the new program to be so generous to smaller dairy farmers that in two years he will be criticized for doing something "that is too good, but that is exactly what I tried to do." Small farmers produce only 14 percent of the milk supply, he said, so if they "go hog wild" on increasing production they will not make that big a difference in the milk supply. Peterson said he does not know whether the House and Senate leadership can get the conflicts over disaster aid "untangled," but that he believes the southerners are most in need at the moment because pecan and peach trees have not been covered by the farm program. Farm bill conservation programs can help a lot of Midwestern farmers, although those programs may need more money, he said. The only thing that is not covered is stored grain, and he said that when providing disaster assistance to help the midwesterners who have lost grain in storage, someone will point out that they could have bought insurance even if it is expensive, he added. While grain bins have been damaged by flooding in Iowa and Nebraska, USDA, at his urging, helped "put a ring dike around every farmstead in the Red River Valley" in 2009, Peterson said. Peterson said he thinks the Trump administration's proposal to move most of the employees of the Economic Research Service and the National Institute of Food and Agriculture out of the Washington area "is a dumb idea," but that the issue will be up to the appropriations committees to handle. He noted that members of Congress have been "running around trying to get" ERS and NIFA located in their districts, but it is hard to attract "high level people" to smaller communities. He said Schwan's, the food company, has had a hard time attracting executives to Marshall, Minn., and that "a lot of people don't want to live in Fargo (N.D.) because it is too damn cold." "It's not because of the people who are going to do the work, but because of the spouses and their families," he said. Some farmers do tell him they have concerns about consolidation in agriculture, but "there isn't a hell of a lot they can do about this." "We have antitrust provisions in the law, but does anything happen with it? There is going to continue to be consolidation. People who think that destroying big farms will make small farms are out to lunch." Peterson said he is "very concerned" about the impact of the tariffs on steel and aluminum that the Trump administration has imposed on foreign countries, noting that he doesn't see "any upside" for agriculture from the current trade war.